CRAZY DISCOUNT! Was: $179.95 Now: $119.98! 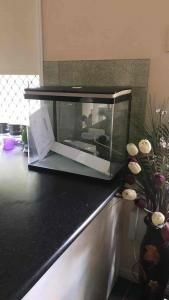 The tank is Curved Glass design for maximum display in any angle and it equipped with high quality features that both you and your fish will love. The convenient hinged hood allows plenty of rooms for easy access and maintenance. The Low noise, high energy water pump with 8W 500L/hr flow, low energy 7W RGB LED lighting to provide UV for plants and a complete filtration system. The aquarium suits both freshwater and saltwater fish/water animals. The size will suit many places, including space limited apartments. 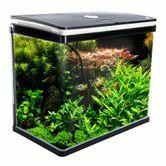 Grab this amazing aquarium and add to your living room a touch of beauty and fun. *Please note: Pet fish, plants, gravel not included.